California's wildflower blooms can be so dazzling that it's hard to believe they are real, not just when you see a photo, but when you're standing there looking at them. In a particularly good year, those eye-popping blossoms can be the topic of national news stories and the subject of thousands of social media posts. It's not surprising that a California flower trek is on a lot of people's bucket list. If you pack your bags to see the wildflowers without knowing a few basic facts, you might end up more disappointed than enchanted. The most important thing to know is that those super blooms that make the news don't happen every year. It takes a perfect combination of rain, temperature, and sunshine to bring out those carpets of blossoms that everyone wants to see. Unfortunately, no one can predict them very far ahead of time. The resources below can help you find out the current year's status. The good news is that the state's wildflower season lasts for months and you can always find flowers blooming somewhere. Blossoms begin at the lowest elevations early in the year, but you can see them well into early summer in the mountains and on the northern coast. To get information about this year's bloom status, the Theodore Payne Foundation Wildflower Hotline is the best all-in-one resource you can find. However, their reports are submitted by volunteers who occasionally overstate the extent of blooms. These are some of the best places in California to check out this year's wildflowers, in rough order of their blooming season. Located south of Palm Springs, Anza-Borrego State Park often puts on the best desert wildflower show in California. The bloom season is January through March. Anza-Borrego is noteworthy for the wide variety of its flowering plants and cactus, in colors so bright that it's hard to believe they're real. It's also reliable with at least some blossoms every year. However, Mother Nature's timing can be unpredictable, making it hard to know when to reserve a place to stay. You can check this year's bloom status before you go, but by the time the flowers start blooming, it may be too late to find a place to stay in the area. Use the guide to Anza-Borrego Park to plan your trip. You can camp in the park if you make reservations far enough ahead of time, or look for a place to stay in Borrego Springs which is about 20 miles away. Don't let those out of date headlines fool you; it's a rare year when flowers bloom in Death Valley. In fact, the park's so-called super blooms may only happen every five to ten years. And when they show up, Death Valley's wildflower displays are eye-popping because they occur in a landscape so devoid of color the rest of the year. When the perfect combination of conditions align to bring the flowers out, it usually between mid-February and mid-April. Use the Death Valley visitor guide to plan your trip. The only way to know whether the flowers will bloom this year is to get this year's status at the Death Valley website or join their Facebook group by searching for "Death Valley Flowers." Unfortunately, by the time word gets out about a super bloom, all the places to stay in Death Valley and the surrounding towns already have out their "no vacancy" signs. If that happens, your only option to see the flowers may be to visit on a day trip from Las Vegas. To find out the best way to get there, use the guide to visiting Death Valley from Las Vegas. In a good year, North Table Mountain is decked out in more than 100 kinds of wildflowers. Bloom starts in February and peaks in March and April. Guided tours are offered then. Get more details on their website, where can also sign up for a guided tour. North Table Mountain is an ecological reserve and doesn't have any facilities for overnight stays. It's about 75 miles from Sacramento and just a few miles from the town of Oroville, where you can find lodging. Many Californians don't know about this protected valley west of King City that is little changed since Spanish colonial days. The land has never been cultivated, making it a great place for spring wildflowers. As a plus, the area is never crowded, although knowledgeable nature photographers flock there in the spring to photograph the California poppies, lupines, owl's clover, and many more varieties. In most years, bloom time is March to April. You can stay overnight in King City or use the Valley of the Oaks guide to plan a visit. The Carrizo Plain is one of California's least-visited sights, but the wildflower displays that follow a rainy winter there are some of the state's best. During that time, docents lead tours to see them. The Carrizo Plain is between US Highway 101 and Interstate 5 near the town of McKittrick. Check the Carrizo Plain National Monument website for information about this year's flowers and about their campground. In a good year, the carpets of orange-hued California Poppies… well… (to use a well-worn phrase) you'd have to be there. The star of the show—and pretty much the only thing that blooms in Antelope Valley about 90 miles east of Los Angeles—is the California poppy. 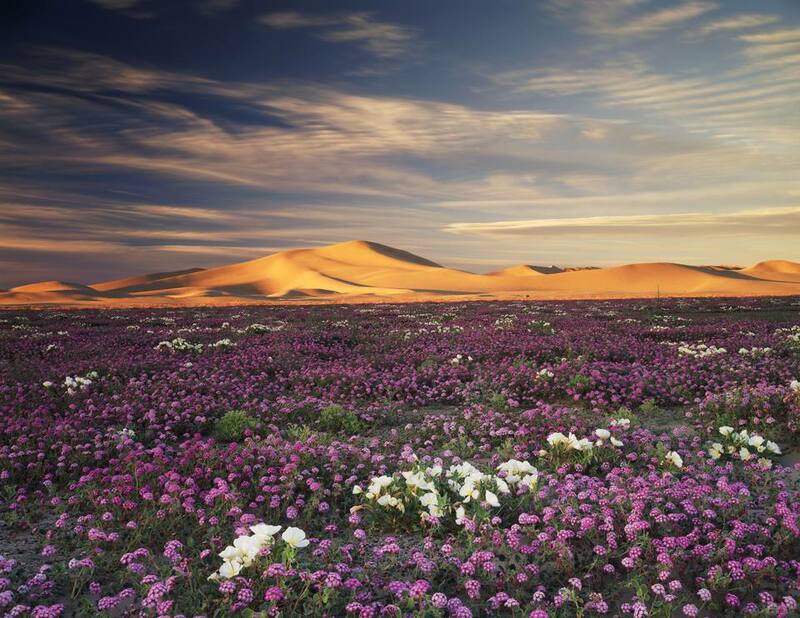 Antelope Valley's extraordinary blooms come once in a decade, but in other years you can still enjoy the scene. Bloom time starts in mid-February and lasts through mid-May. Occasionally, nothing blooms at all, making it imperative to find out the current conditions. Use the Antelope Valley guide to get tips for having a good visit and how to find out whether the flowers are blooming this year. Wildflowers bloom a little later in the Sierras, following the wave of blossoms in the desert. Most visitors speed right past the Hite Cove Trail on their way to Yosemite, but the number of cars parked near a seemingly insignificant trailhead is a clue. In fact, the Hite Cove Trail is one of the most spectacular places in the Sierras in late spring. Some say it's the best wildflower hike in California. The best time to go to Hite Cove is March through May, and you can find out how to get there and where to stay in the Hite Cove Trail guide. The truly charming part of the wildflower bloom east of the Sierras is that they spring up in fields where cattle are grazing. If you pay attention, you'll sometimes find the cows nibbling the petals. The iris blossom between late May and July, depending on elevation They start first around Bishop and bloom later near Mammoth Mountain. The flowers are only one of the many things you can see during your visit, and you can stay anywhere from Bridgeport to Lone Pine while you're there. Use the guide to Scenic Highway 395 to plan your trip.